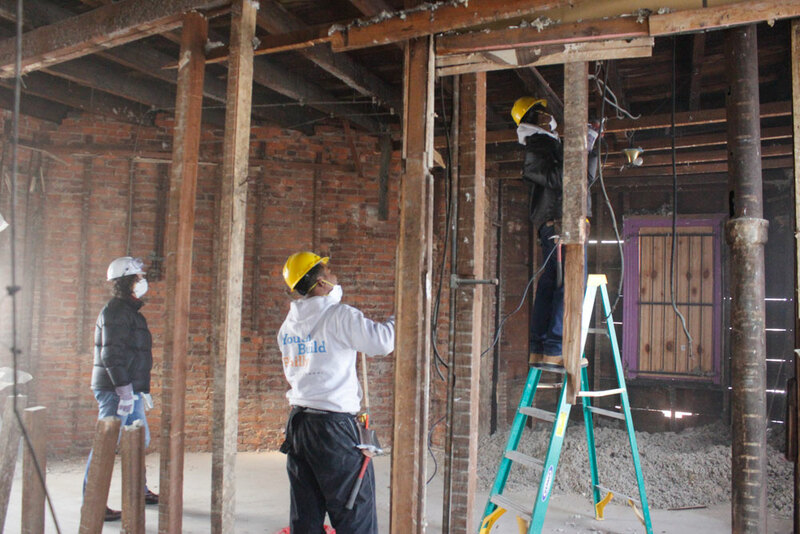 In February and March, YouthBuild Philly students renovating the Wingohocking St. construction worksite in Nicetown received some assistance – and valuable advice – from a unique group of volunteers who called themselves “Junto 7.” The members of Junto 7 are participants in LEADERSHIP Philadelphia’s 2014 Core Program. This program prepares leaders in the Philadelphia region’s private sector to serve the community as non-profit board members. During the training and leadership development process, Core Program participants are grouped into cohorts (or Juntos) that partner on projects with area non-profits. 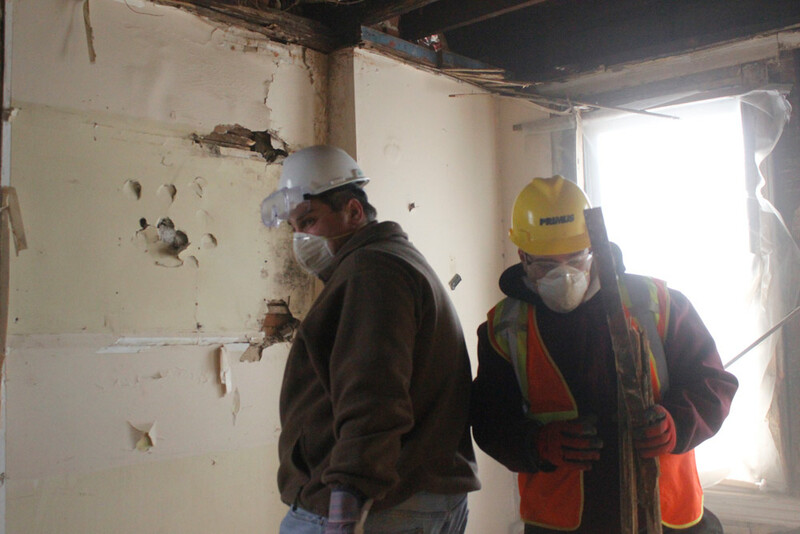 The Junto 7/YouthBuild Philadelphia project consisted of five weekly sessions during which the LEADERSHIP volunteers would visit the Wingohocking worksite, put on hard hats and dust masks, and work alongside students in the process of deconstructing the abandoned properties and preparing them for renovation. 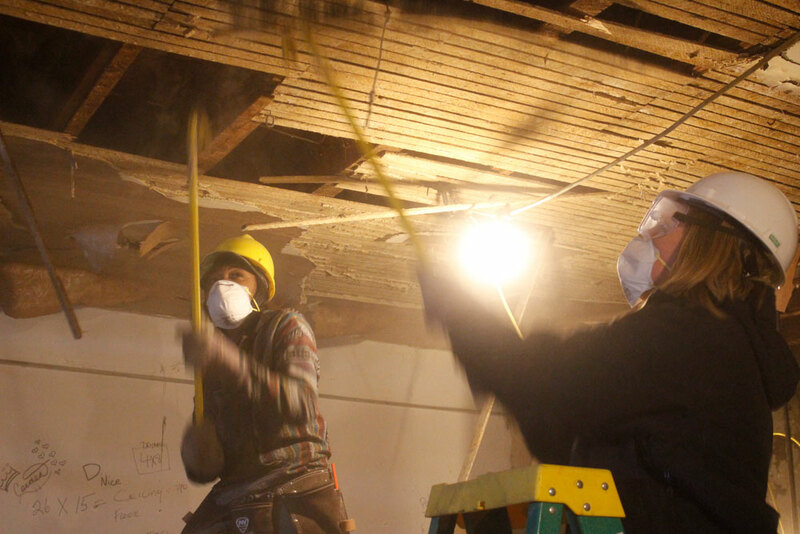 This was hard, dusty work in freezing weather – but it gave volunteers the opportunity to learn from and be led by YouthBuild students who have been at the worksite all year. Over the course of the five weeks, the volunteers also shared their own expertise with students by providing career advice during breaks on the worksite. For example, Betty LeHew, Assistant Vice President for Human Resources at the Educational Commission for Foreign Medical Graduates, told students to take goal-setting seriously: “Outcomes are about having a long-term goal and having short-term goals. If you have a long-term goal and no short-term goals to get there, you’ll have a stronger chance of failure than success.” And John Kalina’s advice to students was “Make [professional] relationships strong enough, to the point where someone knows your work ethic.” John is the Vice President of IS Business Management at Independence Blue Cross. 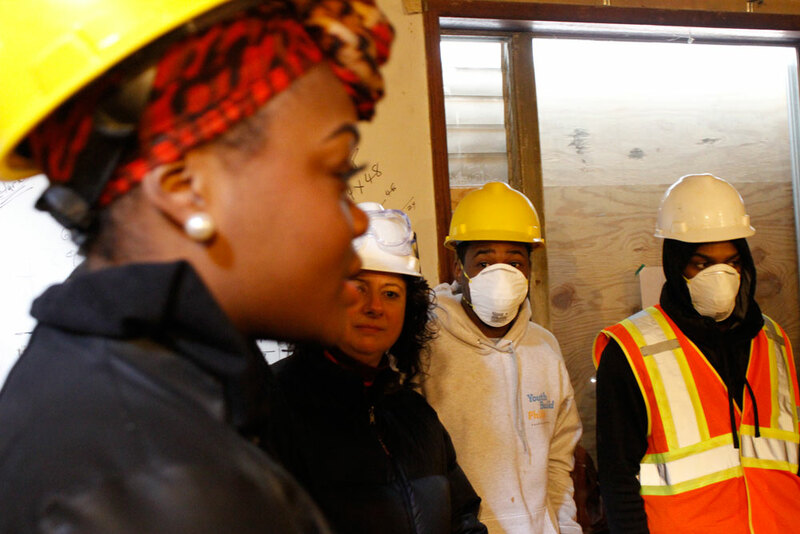 For a total of 5 sessions, Junto 7 and YouthBuild Philly’s GreenBuild and Advanced Construction vocations partnered in building physical structures and building strong, prepared young adults for their careers. On March 12th the project culminated with a tour of PJM Interconnections, a firm (where one of the Junto 7 volunteers works) that coordinates the movement of wholesale electricity within various U.S. regions. The partnership presented a unique opportunity for YouthBuild students to teach the LEADERSHIP Philadelphia volunteers the skills necessary to accomplish their tasks on their worksite and for the YouthBuild Philly students to learn “tricks of the trade” to accomplish their responsibilities in their career aspirations. “We went all in and got so much out of it,” said Laurie Zierer, Executive Director of the PA Humanities Council. Students in the construction squads agreed. Student John Laderer reported that the experience motivated him to continue pursuing his career goal of being an Aviation Mechanic, and gave him leadership skills to help his younger brother make smart choices. Thank you, Junto 7, for your hard work and caring mentorship! Your leadership has made a real difference on Wingohocking St. and in our students’ lives.